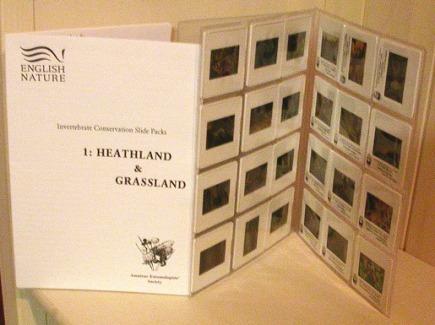 The English Nature/Amateur Entomologists' Society Invertebrate Conservation 35mm Slide Packs were first produced in 1997. Over time they have proved to be extremely popular and effective. Four slide packs have now been produced, each contains twenty four high quality invertebrate pictures and a booklet of explanatory text, allowing a presentation to be given solely around the 35mm slides provided. Pack one contains the series on Heathland and Grassland and features invertebrates such as the Silver-studded blue, the Yellow meadow ant and the Orb web spider. The second pack contains invertebrates from Woodland and Wetland habitats, such as the Golden-ringed dragonfly, the Plaited door snail and the Spotted ground beetle. Pack three focuses on Upland and Farmland and pack four contains invertebrates from Coasts and 'Brownfield' sites.